Eco-Friendly Lunch Week has began! I’m super excited to show off my favorite lunch items (like reusable cloth lids!) that we use in our family, plus a few new ones that I have been wanting to try and now get to share with you! First up and a must have for every kitchen….Rebel T/L/C‘s! Kelli was first on the blog in November showing off her very inventive tops, lids, & covers. Read my first review here where you can learn more about how plastic wrap is BAD and how Kelli makes her T/L/Cs. I love and use them so much that I recently ordered 4 more! The large one is custom sized so if you need a shape she doesn’t have listed just ask! The Small size (front left) is the perfect fit for a cereal bowl to send your kids with leftovers in their lunch (as long as it’s not something with liquid) and a Tiny (front right) can be used on a small bowl or short drinking glass to send snacks as well, like veggie sticks! A new idea Kelli creates, but doesn’t have listed in her store yet are Sandwich Wraps. As you will see I let my boys pick out their own fabric. Dragons and flames! Why are these sandwich wraps totally awesome? I can fit any size or shape in there! My boys love bringing bagels to school, rolls, & chicken fajita wraps. It’s a multi-purpose too! A placemat! The boys think they are double cool now and my next order will be one for P’Diddy to keep in the diaper bag. How many times do you wish you had something to put babies food one when you are out and about? You HAVE TO try out some Tops/Lids/Cover or Sandwich Wraps for yourself! You will LOVE these reusable cloth lids! I was not compensated in any way for the post, but received review items. and all opinions are my own. 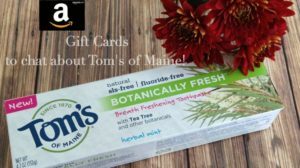 Earn Amazon to Chat about Tom’s of Maine! + giveaway! i like either the camo prints or the blue flames! I love the keep it green and the fruit trees patterns... what a great, unique idea! I love the fruit tree fabric for covers! I LOVE the Bamboo fabric! It would be perfect in my kitchen. I love these!!!! I like the kitchen mod print!!! I love a ton of the fabric choices, a few being Kitchen Mod, Shrooms, Apple Dance, Bumble Bees, Over Easy, and several from Fooood! It is so hard to choose, but I hate using plastic wrap and probably need all the sizes, we always have leftovers. I follow via GFC (Ashley) and facebook (Ashley Toth). i like the tree fabric in all the covers! Wow she has like a million fabric choices. I love the yellow words to live by. I love the idea of not having to use plastic wrap or foil! I also love the great fabric selection! I like Rebel T/L/C on facebook! I am a gfc and fb beach bum! I love the Fruit Tree pattern. I love them all. Would take so many of the useless dishes out of my cupboard with these covers to go on the dishes I use regularly. The Wet Reflections would be my favorite material pattern. I love that she offers such a wide variety of fabrics & patterns! I love this idea! I hear about them a while ago but then they were on hiatus and I'm so glad to hear they are back! I will have to get some. I like the vitamin c print! I'm a Beach Bum x 2. I'm an e-scriber as well. I love the XL lid with a pocket! I like the lid tops and owie pads, the earth fabric is perfect! Oooh, I want every size :) I love the kitchen mod and over easy fabrics! I love the Quilt Star. I loved the rainbow ones! Very cute! I LOVE the apple print Size 8 - 8x8 PAN covers! Oh my. I love these! I need a big bowl cover. I'm loving the teeny and tiny lids in "apple dance". i'm a google friend (heatheranya)! I like the sandwich wraps in gold dragon print! I love the red dragon fabric! A set in that print would be awesome! I love anything that is reusable and not wasteful. I especially like the Sunset peace fabric. I love the sandwich wrap in FRUIT TREES. Those bowl tops are super cool! Beach bum google friend and FB follower. I like the dryer satchets and the fabric keep it green. Wow - huge array of fabric choices! I like the rainbow stars. I really love the doggies print. The Owie Packs would be great for my kids! i love the size 10 ones. I have baking \pans without lids so i always use foil on them. my fav fabric is "something red"
I like that the tiny is perfect for a yogurt container.